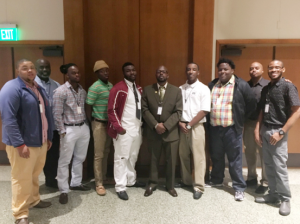 Twelve representatives from Arkansas State University Mid-South recently attended the National Consortium on College Men of Color (NCCMC). The conference was held on the San Diego State University campus in San Diego, California June 8-9. The NCCMC conference allows students to network with others from different colleges/universities across the United States and learn innovative ways to be successful in all aspects of life. In addition, the conference supports faculty, staff and administrators with access to information and resources that would help implement or enhance a Men of Color program on their campus. Types of resources include topics such as funding streams, interventions, and objectives. The National Consortium on College Men of Color (NCCMC) supports postsecondary institutions in building the capacity necessary to advance outcomes for college men of color. This mission is carried out through development activities and conferences that build a community of learners who can engage in collective sense-making, organizational learning, and change. NCCMC member institutions are comprised of public and private community colleges and four year universities. The consortium efforts prioritize men who have been historically underserved in postsecondary education. As a result, intensive focus is given to African-American, Latino, Southeast Asian, Native American, and Pacific Islander men. Arkansas State University Mid-South joined the National Consortium in fall 2015.